After the very successful SandBox outdoor archery, Alviera recently presents the first ever archery challenge maze in the country. Country’s first archery challenge maze is where archers can run through a maze and face moving targets and obstacles, all under time pressure. This new SandBox attraction in Porac, Pampanga is called Aqtiv Archery and is expected to provide a whole new exciting outdoor experience. The SandBox outdoor archery range, operated by Oculus Archery, has had over 5,000 visitors since the attraction opened last year. 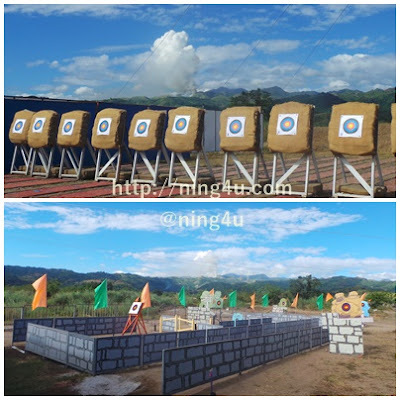 Children as young as 7 years old to some strong seniors, all new to the sport, have found their bliss in this outdoor feature as they learn the basics of archery in a stationery setup consisting of 12 lanes of targets. Aqtiv Archery participants are given a mission that must be completed within 3 to 5 minutes in the maze depending on the mission’s level of difficulty. Expect turns and twists and moving targets, like for example in the first mission, archers will face off against Monsters of the Wall. They will be on the run, which adds difficulty to the activity. And to keep the themed a more fun setting, participants will be wearing headgear. The SandBox offers different archery packages but first-timers can try the 30-minute target archery first. It includes basic lessons, equipment and a stationary target. This is a pre-requisite before guests can try Aqtiv Archery, which requires basic archery knowledge that has to be combined with agility and hand-eye coordination. Archers who beat the set time for the challenge will be granted Archery Elite status and will win some tokens from Oculus Archery. Every end of the month, the top 5 fastest archers that completed the challenge will be showcased. 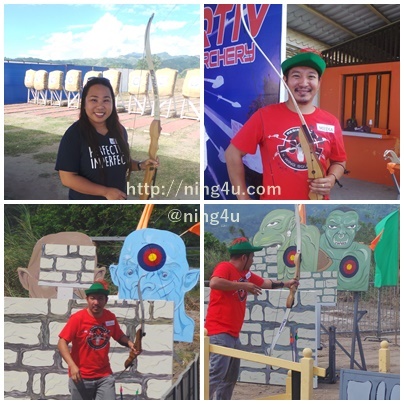 Rate for Aqtiv Archery is at P250 per attempt on the challenge maze and a package rate of P400 includes 30-minute target archery. Alviera and Oculus Archery will look into hosting tournaments in SandBox in the near future, in partnership with academic and sports institutions. Visit SandBox and you will enjoy more SandBox attractions with your families, friends and even corporations. The longer and now tougher Aerial Walk takes visitors through an obstacle course above ground. The Giant Swing keeps riders thrilled 10 meters up, and many are lined up for the Adventure Tower’s offerings: rappelling, wall climbing and free fall. Other thrill seekers enjoy Avatar One, Asia’s first roller coaster zipline at 180-meters long. 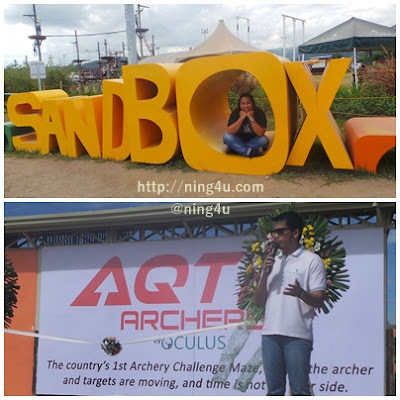 The SandBox’s open fields are ready for outdoor activities like camping, kite-flying, field games and other sports. Visitors can also watch out for exciting signature events such as the upcoming summer music and camping festival, Brightscape Campfest. For more information on SandBox at Alviera, visit http://www.alviera.ph/ and http://www.facebook.com/AlvieraPH. For inquiries, email info.alviera@gmail.com or contact 0917-803-3099 / (045) 432-0014.